In Judge and Jury, the fear of litigation is shown to reduce innovations, drive physicians and manufacturers out of lawsuit-prone specialties, and increase manufacturing and consumer costs. In the courts, data from thousands of cases all over the country demonstrate that tort system awards are driven by political factors such as judicial elections, jury compositions, and the location of courts themselves. 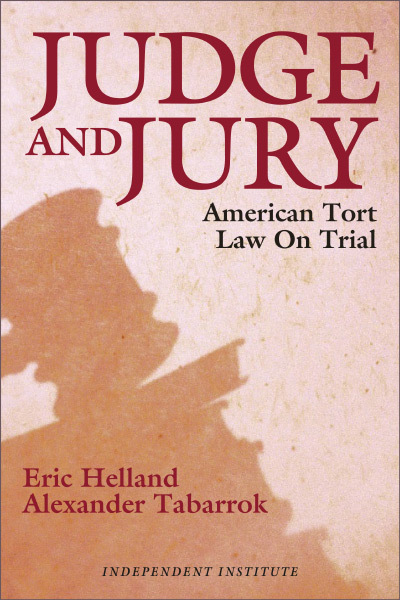 This book assembles the unprecedented findings and insights by authors Eric Helland Alexander Tabarrok, who have pioneered economic and legal research into the injustice and enormous costs created by the politicization of the tort law. Seeking to reverse the extremely harmful trends in tort law, Judge and Jury assembles innovative alternatives for reforming the tort system and charts a course toward re-establishing fair civil justice for all in the United States.  Between 1980 and 1990, tort awards, adjusted for inflation, increased on average by 8.2 percent a year in state courts and a whopping 17.4 percent a year in Federal courts.  In Year 2000 dollars, the average medical malpractice settlements in Florida increased from about $75,000 in 1980 to more than $250,000 in 1990 and declined mildly in the late 1990s.  For every dollar of tort awards paid by defendants, only 46 cents goes to the injured party, while 33 cents go to legal fees, and 21 cents go to other administrative overhead costs, such as the cost of distributing insurance payments.  Awards vary by county poverty rates. As county poverty rate increases from 4.1% to 21.9%, the average award triples from just over $400,000 to just over $1.3 million. For every percentage point increase in the poverty rate, awards increase by about $34,000.  Awards vary by the ethnicity of poverty. A percentage point increase in black and Hispanic poverty rates raises awards by $20,000 and $78,000, respectively, but the same percentage increase in white poverty rates decreases awards by $8,644.  Partisan elections encourage judges to rule in favor of larger awards. In cases involving out-of-state defendants and instate plaintiffs, the average award is $363,000 higher in states with partisan elections compared to states with nonpartisan elections. Approximately $230,000 of the larger award is due to a bias against out-of-state defendants, and the rest is due to generally higher awards against business in partisan states. Is the U.S. tort system in crisis? CBS televisions 60 Minutes has said the tort system metes out jackpot justice, and Newsweek has called America a Lawsuit Hell. Other observers of the legal system, however, argue that the tort crisis is a myth. Although both sides of the debate rely primarily on anecdote and the selective use of evidence, a sound diagnosis of the tort system requires a rigorous analysis of hard data, not a retelling of sensationalistic sound bites. In Judge and Jury: American Tort Law on Trial, economists Eric Helland and Alexander Tabarrok present their study of tens of thousands of tort cases from across the United States. The result is the most complete picture of the U.S. system of civil justice to date. Examining three of the key players of the tort system (juries, judges, and lawyers), Helland and Tabarrok conclude that the tort system is badly broken in some respects but functions surprisingly well in others. The U.S. tort system has expanded significantly since the 1970s, whether measured by tort expenditures, awards, settlements, or filings, Helland and Tabarrok show. As a percentage of U.S. gross domestic product, tort costs nearly doubled between the early 1970s and the late 1980s. Tort costs declined somewhat in the early 1990s (due to reforms enacted in Florida, California, and elsewhere), but tort costs are still high historically. Traditionally, the tort system dealt with claims of personal injury caused by strangers, such as the manufacturers of automobiles or consumer products. Contract law, rather than tort law, dealt with injuries incurred when the parties had a preexisting relationship, such as doctors and patients. This tradition broke down in the 1960s, as the courts moved increasingly from a negligence standard (Did the defendant fail to exercise reasonable care?) to a strict-liability standard (Did the defendant contribute to a harm whether or not one was direct or foreseeable?). Medical malpractice, now the province of the tort system, still uses the negligence standard, albeit a broader version than what prevailed before the 1960s. Also during the 1960s, the courts began to hear claims that they would not have considered previouslyeven claims they would earlier have laughed out of court. In his novel The Bonfire of the Vanities, author Tom Wolfe portrays a plaintiffs lawyer who files malpractice claims in poor, predominantly minority communities in the Bronx because, as the character put it, the Bronx jury is a vehicle for redistributing the wealth. Is the Bronx effect real? Do jury awards vary by such characteristics wealth and race? Helland and Tabarrok show that jury demographics do indeed affect awards. Jury awards increase as black and Hispanic poverty rates increase in a countyeven after controlling for other potential causes such as injuries, population densities, and case types. Settlement amounts also increase with increases in black and Hispanic county poverty rates. Surprisingly, however, as white poverty rates in a county increase, awards actually fall (or, in Federal cases, increase only moderately). For better or worse, lawyers have a sound reason to forum shop in the hope of finding a more sympathetic jury: it pays. To arrive at these conclusions, Helland and Tabarrok examined three data sets that covered tens of thousands of trials. From the JVR Personal Injury Verdicts and Settlements data set (198896), they examined 42,315 trials, from 1,803 counties, that resulted in plaintiff victories. The wide range of cases (51% are auto accident cases, 14% are premises liability, 7% are medical malpractice, and 4% are product liability), allowed Helland and Tabarrok to control for several factors. The Civil Justice of State Courts data set (1991 92) gave Helland and Tabarrok data on fewer trials with awards (3,199), from 45 populous counties, but it had the advantage of depicting a random sample of trial awards. Finally, Helland and Tabarrok examined approximately 5,000 cases from a Federal court data set (19881992) to focus on personal-injury torts between parties who live in different states. They then compared the three data sets with county demographic characteristics reported in the 1990 census. After hearing that county poverty rates affect tort awards, some might suggest that the United States phase out juries for civil cases and rely exclusively on judges, as all but a few countries do. But this proposal assumes that judges and juries act much differently a premise Helland and Tabarrok test. When juries and judges are given the same kinds of cases, the average judge award is lower than the average jury award. But only one fourth to one third of the difference in average award rates is attributable to whether a case is heard by a jury or by a judge. What matters more is that juries and judges hear different kinds of cases. Perhaps it shouldnt surprise us that judges grant awards similar to juries, because the tort expansion was initiated by judges. In some respects, however, judges and juries do act differently, Helland and Tabarrok find. Juries appear to be swayed more than judges by appeals to redistribute wealth, and they appear to be more open to emotional appeals when plaintiffs have suffered grievous injuries. But judges and juries act more alike than is commonly believed. Judges are often political animals. Of the 23 states where voters elect their judges, 10 use highly competitive partisan elections whereas the other 13 use nonpartisan elections. (Federal judges are appointed and have life tenure.) These differences in electoral systems greatly affect tort awards, Helland and Tabarrok show. If America has become Lawsuit Hell, are contingent-fee lawyers its devils? Critics have lambasted trial lawyers for collecting large feesbillion of dollars worth in the tobacco industry lawsuit tried on behalf of state governments. But do astronomic contingent fees encourage excessive and frivolous litigation or create conflicts of interest between clients and attorneys regarding settlement decisions, as some have charged? The case against contingent fees is weak, Helland and Tabarrok argue. They were common in the United States long before the liability crisis. Furthermore, they can reduce frivolous lawsuits because a lawyer on contingent fee is unlikely to take a case he thinks will lose. In contrast, a lawyer who is paid only by the hour might be willing to take a case even if he believes it will ultimately lose. In fact, Helland and Tabarrok find that in states with restrictions on contingent fees, plaintiffs ultimately drop 18 percent of medical malpractice lawsuits, whereas in states without restrictions plaintiffs drop only 5 percent. Because juries are an important check on abusive government power, replacing them with appointed judges would likely create new problems. However, reforms could be implemented so that judges and juries are not given cases for which they lack the incentive or capacity for deciding objectively. Creating diverse juries drawn from larger geographic areas, as is done for federal trials, could alleviate some of the problems of out-of-control juries. The Class-Action Fairness Act of 2005, which moves some kinds of class-action lawsuits into federal courts, is a step in that direction. Limitations on judges and juries by statute: Caps on damages for pain and suffering may have merit, but damage caps generally do not address the underlying problem. Rather than attacking juries, reformers should seek to help juries to make better decisions. In recent years, for example, most states have raised the standard for expert testimony, which has reduced junk science in the courtroom. Inexplicably, note-taking, an essential in the classroom, is banned for juries in most courts. Eric A. Helland is Professor of Economics at Claremont McKenna College, former Senior Economist at the Presidents Council of Economic Advisors, and a member of the Board of Directors of the UCLA Center for Governance. His articles have appeared in such scholarly journals as the Journal of Law, Economics and Organization, Journal of Legal Studies, Journal of Law and Economics, and Journal of Regulatory Economics. Alexander Tabarrok is Research Director for The Independent Institute, Assistant Editor of The Independent Review, and Associate Professor of Economics at George Mason University. Dr. Tabarroks books include Entrepreneurial Economics, Changing the Guard, and The Voluntary City, and he is co-author of the web site, FDAReview.org.